We respect your privacy. The personal information we are requesting is for use in our in-house marketing efforts. We never reveal, share, or sell customer information. Personally identifiable information provided by our customers (name, e-mail or home address, etc.) is never disclosed to anyone. We use personally identifiable information to process orders. If you have explicitly subscribed to our newsletters, we will use your personal information only to send you said newsletters. We use this information to understand and analyze trends, to administer the site, to learn about user behavior on the site, and to gather demographic information about our user base as a whole. 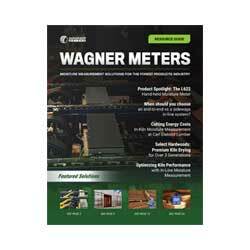 Wagner Meters may use this information in our marketing and advertising services. In some of our email messages, we use a “click-through URL” linked to content on the Wagner Meters website. When customers click one of these URLs, they pass through a separate web server before arriving at the destination page on our website. We track this click-through data to help us determine interest in particular topics and measure the effectiveness of our customer communications. If you prefer not to be tracked in this way, you should not click text or graphic links in the email messages. This website uses Hubspot for marketing purposes. We collect name and email address when you sign up for any of our newsletters. Broadly speaking, we use personal information for purposes of administering our operations, fulfilling orders, providing customer service and making available other items and services to our audience. Our site provides users the opportunity to opt-out of receiving communications from us by reading the unsubscribe instructions located at the bottom of any e-mail they receive from us at any time. If at any time, you would like to view or update your saved personal information, contact us at info@wagnermeters.com and we will supply you with a list of the information we have and what it is being used for. At that time, you may also send us any updates to your information. If you would like us to delete all your personal information, send us an email at info@wagnermeters.com. Once your personal data has been deleted, we will not be able to recover it at a later date.